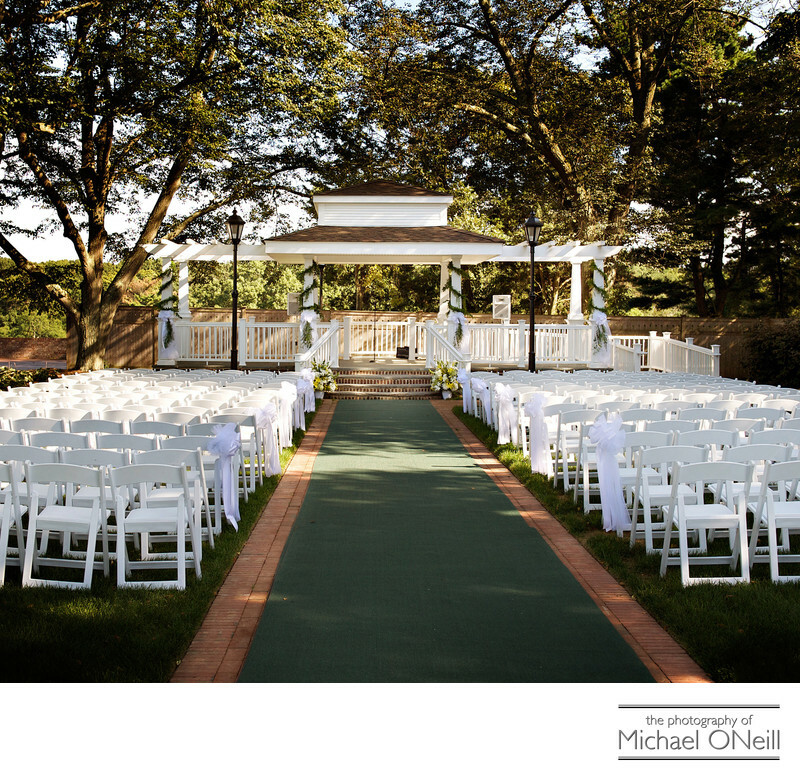 One of the most beautiful environments for an outdoor wedding ceremony on Long Island can be found right here, under the elegant gazebo on the grounds of Carlyle on the Green at Bethpage State Park (home of the world-renowned "Black Course"...the only public golf course to ever host The US Open Golf Tournament...one of the most prestigious events on the PGA Tour). This fine catering establishment is located about 15 miles from my East Northport, NY studio and gallery and I have had the experience of working here many times. Carlyle on the Green is just one of the fine catering establishments owned by the Carlyle Group. The others include Carlyle of Lawrence at Temple Israel in the five towns area, Carlyle at the Palace in Plainview, New York and the retro-styled Carlyle at the Omni located in Uniondale, Nassau County, NY. This photograph was taken just prior to the ceremony. I love to get little details shots like these so the bride can get to see what the ceremony area looked like before all of her wedding guests were seated in anticipation of her walking down the aisle to exchange vows with her partner. I take tons of details photos throughout the wedding day: wedding rings and other jewelry, bridal gown details and adornments, floral displays, bridal bouquets and the groomsmen’s boutonnieres. All of your wedding stationery: invitations, ceremony programs, place cards for seating and dinner menus. Creative shots of the bride’s shoes are probably one of the most requested photographs. After the ceremony I will be taking photographs of your dining room before the guests take their seats. You will see how beautiful your room looked: the linens you chose, the flowers you picked, your wedding cake and cake topper. All of the little details that you gave so much thought to. I will preserve them all for you in a beautifully bound wedding album for years of fond memories.